When spring is in the air, you know it's finally time to put away those heavy wool blankets and fur accessories for the season. Some light and cheery additions to your home can help in welcoming the change in weather. The urge to add new spring decor to your home is contagious and there are endless ways to incorporate your finds into your current decor. Stylish spring decor is more accessible and less time consuming than one might imagine. Take a moment and embrace spring with these stylish, fresh ideas for seasonal decor. Pastels are not just for easter. Bring those pretty pinks, powder blues and gentle greens into your home throughout spring. If you are on a budget, you'll be happy to know many beautiful pastel options are available at IKEA. Need some green your in life? Not only does spring signify the start of fresh blooms, but we begin to crave those gorgeous shades of green in all shapes and forms. The most simple solution is bringing the outdoors inside with indoor plants. Yet another clever idea on using paper florals to celebrate spring. A paper flower lights garland is everlasting if you take good care of its precious petals. It's wonderful for both indoor and outdoor celebrations as well. Do you have a thing for acquiring baskets? Baskets are functional and sweet decor for your home. Try this dip dye tutorial to make your collection extra special for spring. Whether you are hosting Easter dinner, Mother's Day or just a gal's only get together, this classic take on a blush inspired table scape is breathtaking. Keep it casual by having guests sit on pillows versus in stiff chairs. Pom curtains are the absolute cutest! What a stylish way to add some spring flair to your room. The light and airy curtains will feel special with either a colorful or neutral pom pom addition. Spring also means it's time to dust off that beautiful porcelain tea set you keep reserved for sunny days and beautiful people. A tea set makes for lovely decor when not in use. Your friends will be super impressed with your presentation when they come over for lunch. If you are hosting a small group for a spring gathering, a great activity is to DIY paper floral crowns. Each crown is unique to it's creator. This crown is also made of paper, so you can hold onto the keepsake long past your spring arrangements. A decorative wire vase is a special spring touch for all your single stem blooms. Keep it simple with a couple of stems and these beautiful vases can transform an entire room. A rainbow turns every frown upside down. There is nothing more cheery than this paper honeycomb and streamer photo backdrop. It's impossible to have a less than stellar time celebrating spring with this fun and thoughtful decor. Perfect for photo stations at spring parties for children and adults alike. Make vintage modern with this adorable take on a house number planter. Often seen on homes in Palm Springs, California, you can add this little addition to your home this spring no matter where you're located. You will love pulling up in your driveway and being greeted by the flowers in the bloom. Often it only takes a few fresh branches with small flower buds, peeks of green or fruit to add a sense of spring wonder to your home. Buy a bundle and disperse the branches in special vases throughout your home. These branches are versatile and easy to care for. They look especially whimsical once dried over time. A spring floral arrangement is the loveliest addition to any room in your house. An arrangement that always looks fresh and never fades away is ideal. You are going to need a place for all those new plants you'll be bringing into your home this spring. A mid-century inspired plant stand is great for both your small and mid-size plant storage needs. If you are feeling extra crafty, take a stab at a little wood working to create a plant stand for yourself. Changing up art according to the season is a good habit to get into this year. It's no surprise that art makes us feel different ways, so why not look for pieces that make us feel spring happiness? Even better if you are comfortable creating your own art to put on display. Look no further than your home garden for floral arrangement inspiration. By adding unexpected details like a gorgeous head of lettuce or some fresh heirloom carrots, you will be repurposing fruits and vegetables in a fun way. If we are being honest with ourselves, not all spring days are the warmest. It's great to have a cozy throw available on those beautiful but chilly spring mornings. Add some subtle spring decor to any throw you already have in your home. Perfect for your bike basket and so much more! These aluminum can flowers are the sweetest idea for home decor. Children will love helping with the DIY and then using them to decorate every room of your house. Another idea for all those baskets hanging around your house: A fresh arrangement of the prettiest spring flowers in the prettiest spring baskets. These gems also make wonderful gifts for Mother's Day. A vintage leather butterfly chair or stylish Moroccan pouf add some serious bohemian vibes to your home. These accents are really great for outdoor entertaining mixed with fresh blooms. They will easily find a place inside your home as well. 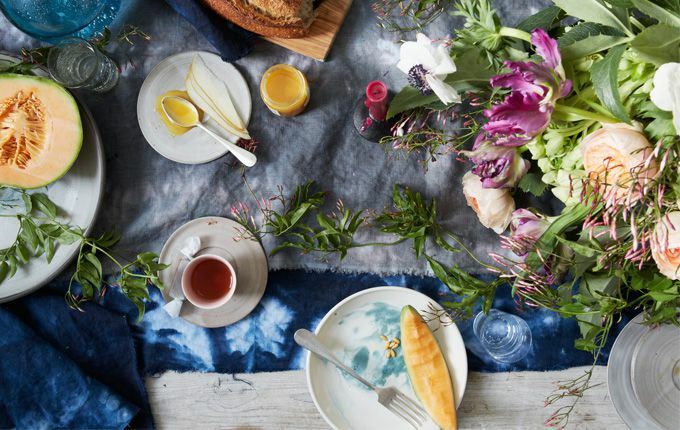 A relaxing and rewarding spring project is painting your own floral tablecloth. If you find yourself with a spare moment this spring, get yourself a glass of rosé and start painting. Decorative utensils are fun way to celebrate spring. These dip dyed cocktail forks are a colorful and playful way to serve dessert. Oh Joy for Target has a great selection of home goods perfect for spring entertaining. Choose brunch desserts that are French-inspired this spring. Cherry blossoms and parisian pastries are the ultimate spring accessories for your home. Can't decide between solids and prints? You don't have to with this clever table setting inspiration from Oh Joy. Stripes with florals, polka dots and your favorite spring colors complete this festive look that can be used for all seasonal gatherings.